Users of AstroPlanner software will likely recognize iLanga and the developer Paul Rodman. AstroAid is one of his newest creations and is available from the Apple iTunes Store for $2.99. (See the iTunes page for a list of supported devices, with iOS 5 or later.) When I first heard about AstroAid (from Astronomy Technology Today magazine), I was intrigued. I contacted Paul and he provided me with an AstroAid redeem code for this review. What is AstroAid? Simply put, it is a Field-of-View calculator for your telescope, camera/imager, and the combination of telescope + camera/imager. But that short description does not begin to describe its usefulness. A few years ago, I manually created an Excel spreadsheet file to document the FOV with my 8" LX200-ACF and DSLR using various eyepieces and adapters. (If you want a copy to modify for your own equipment, you can download it.) Unfortunately, the file data is fixed to the eyepieces, camera, and adapters I use most commonly with my 8" LX200-ACF and does not provide FOV for other telescopes, optical aids, or adapters. There are other, more general, tools to calculate FOV for any telescope/eyepiece; some of these "simulators" and "charts" are available on the Helpful Information: Buyer/New User Tips page. While I have my FOV Measurements file printed out and in my observatory, if I'm using one of my non-observatory based telescopes (the ETX telescopes, for example), the printout doesn't apply. This is why I got intrigued by AstroAid. 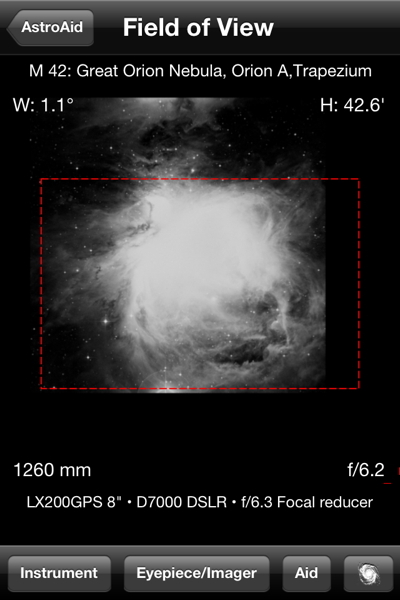 I could have a very general tool that can be set up for all of my telescopes and cameras, and since I have my iPhone (and sometimes, my iPad) with me while at the telescope, I could quickly look up the FOV for any telescope, eyepiece, camera, and adapter. At least, that is what I hoped. How well did AstroAid meet my expectations? Read on. 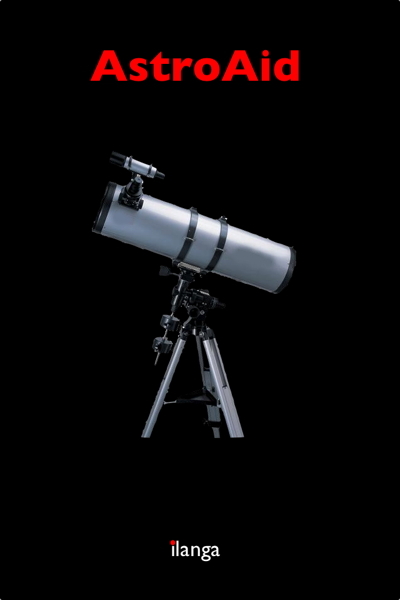 It functions as an aid to visualising what you will see through your telescope or camera lens when you use a particular eyepiece and, optionally, an optical aid (such as a Barlow lens). You can also specify an imager or camera instead of the eyepiece, and AstroAid will show you what will appear in the imager's field of view. 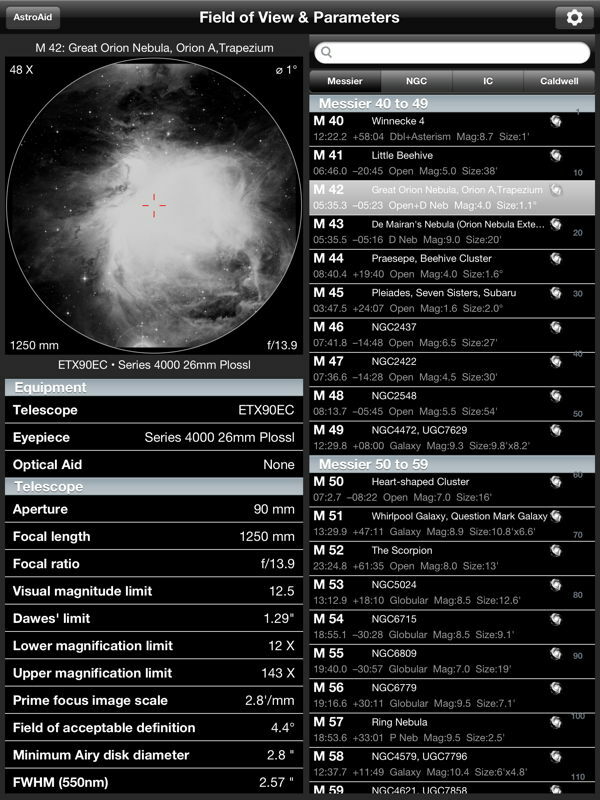 The app computes a number of parameters for your telescope/eyepiece/imager combination, such as magnification, actual field of view, visual magnitude limit, pixel scale etc. and displays these values in tabular form. 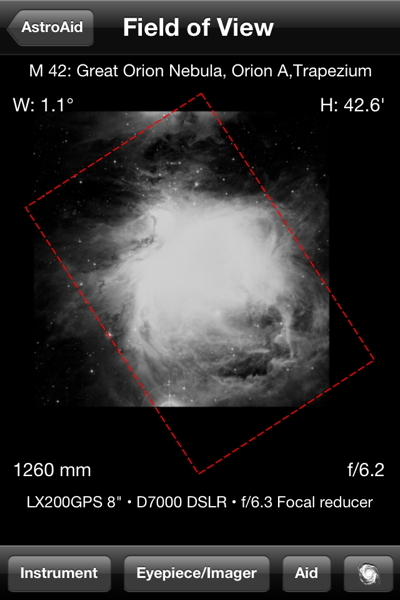 Additionally, the application contains images of the 110 Messier objects and will show you what these objects would look like through the eyepiece (by suitably scaling the images). 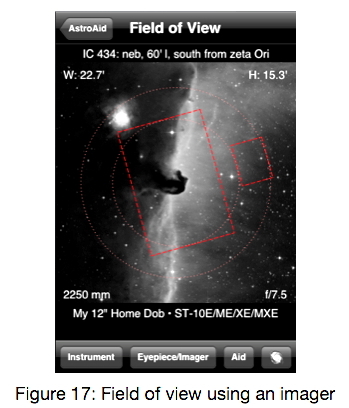 Apart from the Messier catalogue, the app also contains the NGC, IC and Caldwell catalogues, and can download images for each of the catalogue objects. 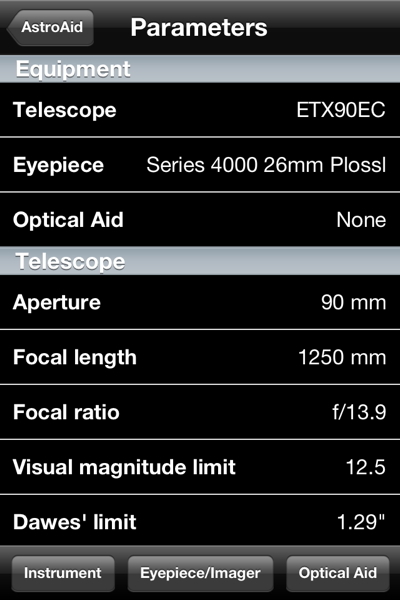 The app contains extensive lists of known vendor-supplied telescopes, camera lenses, eyepieces, cameras, imagers and optical aids. 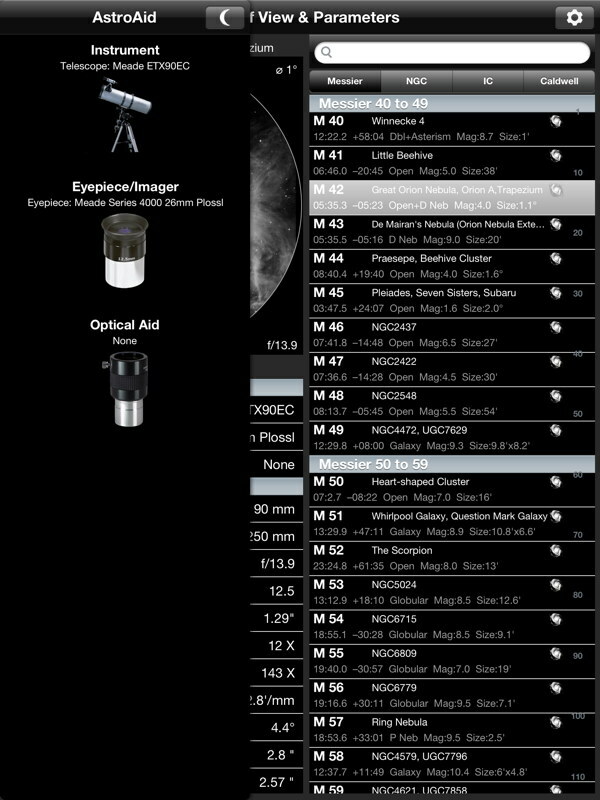 You can also create your own custom entries if your equipment isn't listed (for example, if you made your own telescope). 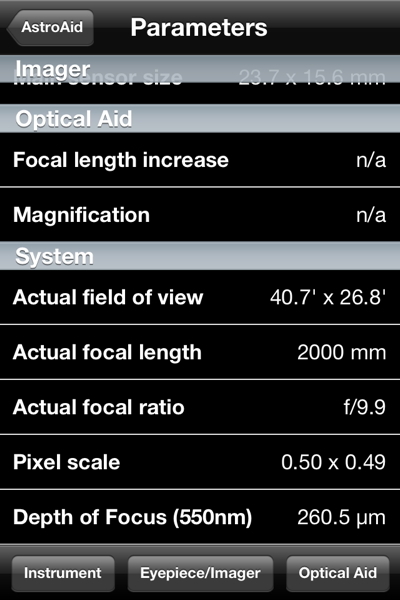 When adding a custom telescope, you need to know two out of three: aperture, focal length, focal ratio. 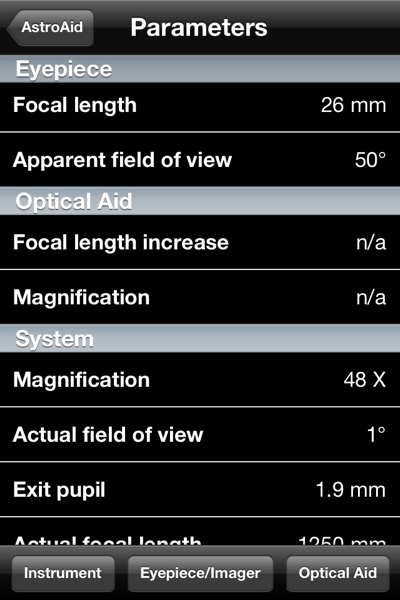 For eyepieces, you need to know the focal length and apparent field of view. 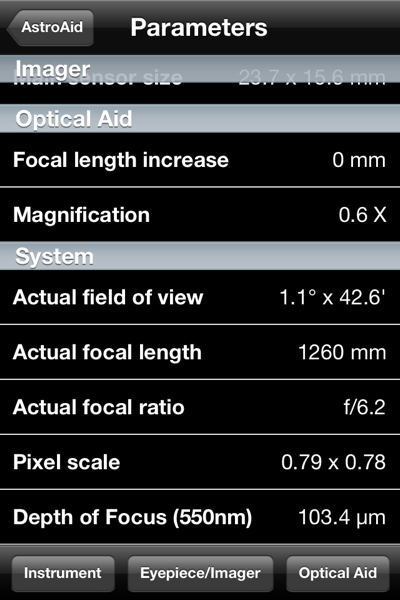 When adding a custom optical aid, you need to know the magnification or focal length increase (decrease). 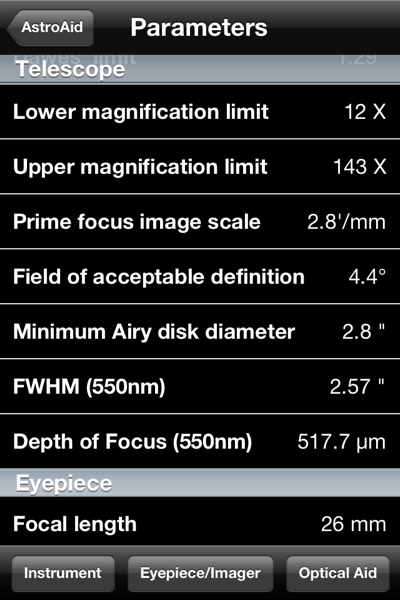 To add a custom camera/imager you need to know the sensor size (number of pixels high and wide) and the pizel size (in microns). 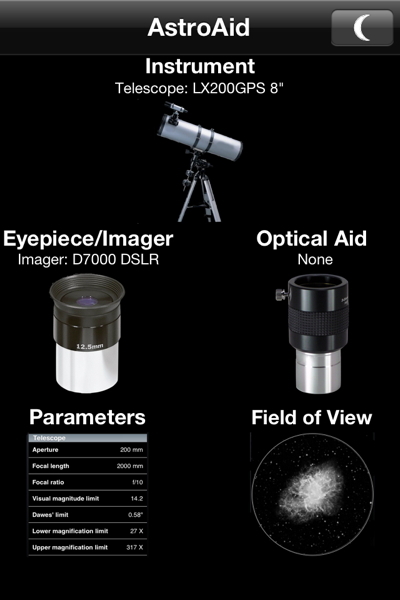 When you want to determine the FOV for an object, you select your telescope, eyepiece, camera/imager, and optical aid, by tapping the home screen icons, as appropriate. 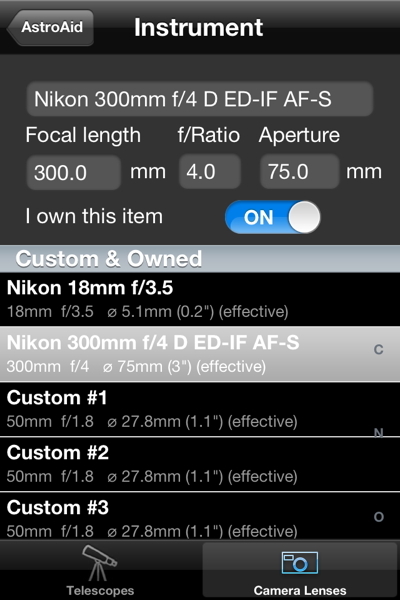 You can view the currently selected parameters by tapping the Parameters icon on the home screen. When you do that, a scrollable list appears. How did these values of 40.7' x 26.8' and 1.1° x 42.6' compare to my manually determined values that appear in my FOV spreadsheet? The spreadsheet shows 40'35" x 26'58" without the focal reducer and 59'48" x 38'13" with the focal reducer. 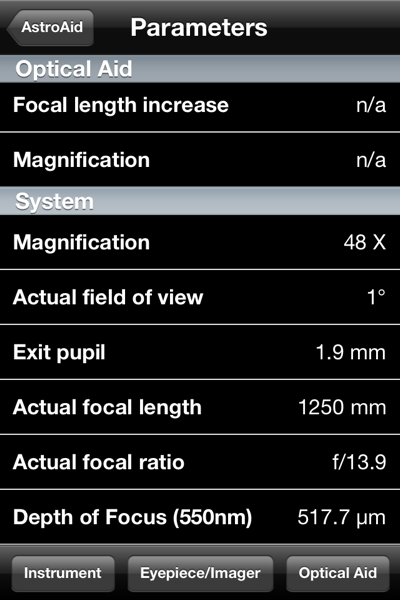 The FOV calculated by AstroAid without the focal reducer is very close to the actual value. 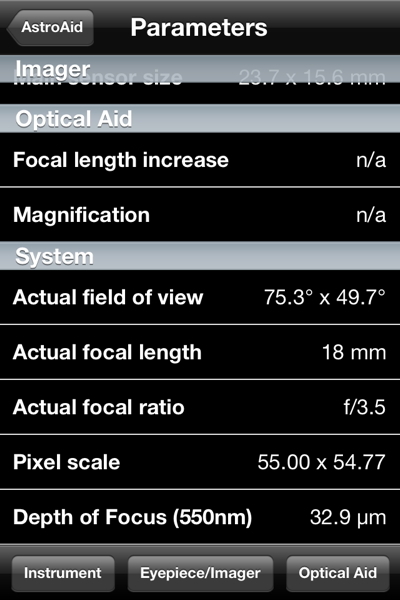 The calculated value with the focal reducer is close but not quite the same as I had manually determined. The difference is likely due to the way I manually determined the FOV for input into the spreadsheet and not due to an error in AstroAid. to my manually determined FOV, as shown in my FOV spreadsheet, 70°09'45" x 51°54'17". The values are similar, well within my likely manual determination error. This is a nice capability if you don't have unlimited data download with your cellular plan and/or you have limited memory on your iDevice. But that didn't surprise me since I can barely fit a full moon (~0.5°) in the 26mm when on the star diagonal. 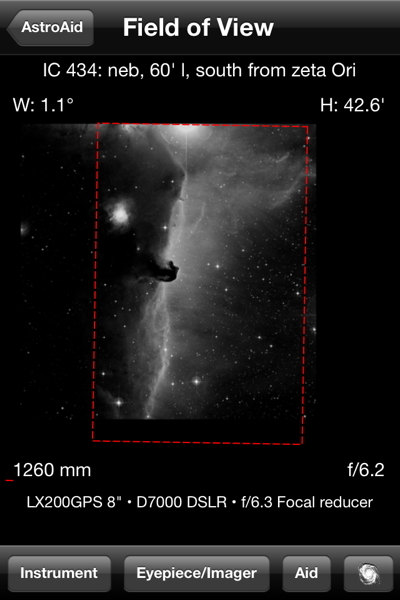 I changed to the visual back and the FOV almost perfectly matched what AstroAid showed. I switched to a 9.7mm eyepiece on the visual back; the view matched very well. There is a night mode, enabled by tapping the "moon" icon on the app home screen. That turns the display red. You can change catalogs from the FOV screen using the galaxy icon at the lower right. 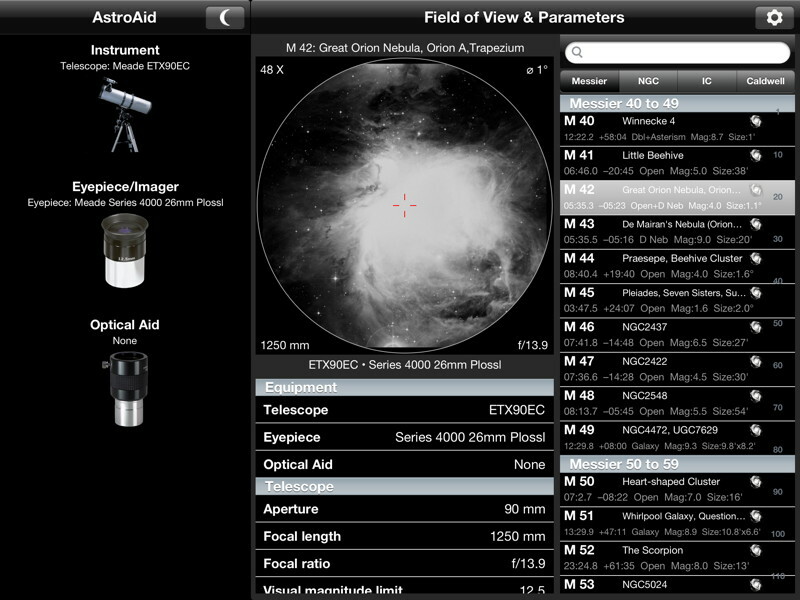 I also tested AstroAid on my iPad with Retina Display. With all my equipment entered into the iPhone, I SYNCed the phone in iTunes. I then SYNCed the iPad in iTunes to see if my equipment would be copied to the iPad. 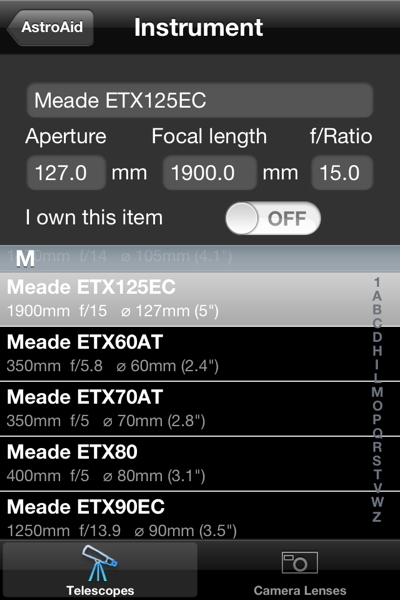 Unfortunately, my equipment from the iPhone version was not copied into the iPad version. I suspect this is not an AstroAid problem but an iOS restriction from Apple. So, I manually added all my equipment in the iPad version. If you have multiple iDevices, be prepared for multiple configuration sessions. Other than these differences, the iPad version functions the same as the iPhone version, except you get the benefit of having the much larger screen. I did have one app crash on the iPhone but it was not repeatable. I also discovered one very minor display bug that was reported to the author and will be fixed in v2.0.1. If you know Paul Rodman, you know that AstroAid will continue to be well supported. 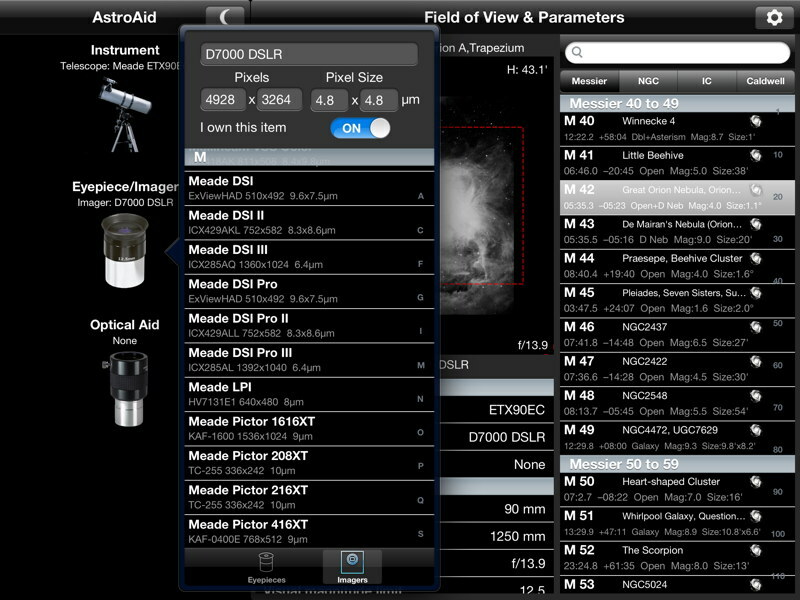 I highly recommend that AstroAid be added to your toolset if you have an iPhone, iPod touch, or iPad. 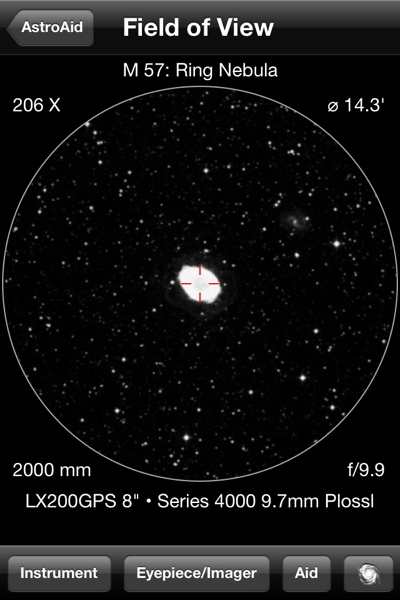 For myself, I'll find AstroAid very handy when trying to view faint and small DSOs at the eyepiece and wondering just how big an object I should be looking for. And I'm going to love using AstroAid when planning my DSLR DSO imaging. Go to the ETX site. 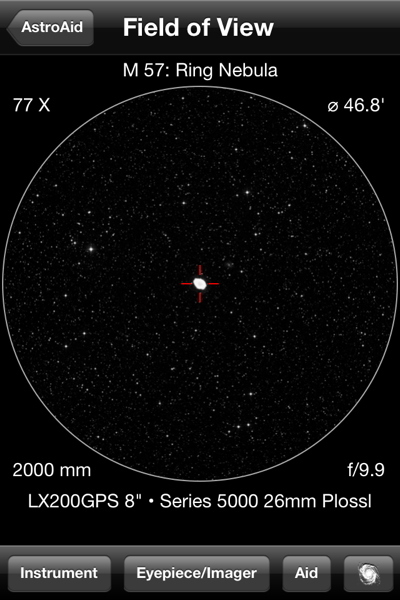 Go to the Cassiopeia Observatory site.